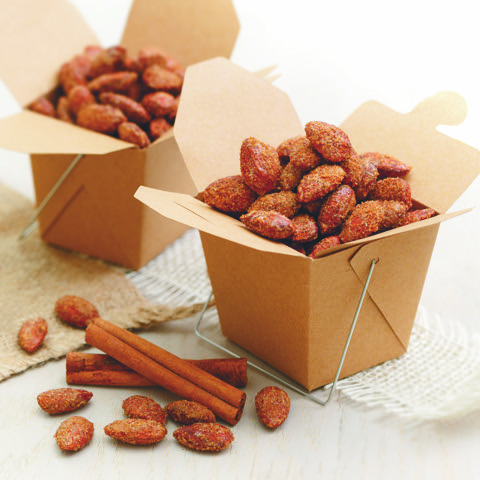 Just like the carnival classic, these candied almonds are a great entertaining snack that packs a great amount of nutrients. A good source of fiber, protein, vitamin E, and magnesium, almonds are often called a “power food” for a reason! Though these are always best right out of the oven, they also make for a great homemade gift when packed in a tin, Mason jar, or cellophane candy bag (just like they sell them at the carnival). You can even package them in 100-calorie portions for perfect on-the-go snacks! 1. Preheat oven to 250°F and line a sheet pan with parchment paper. 2. In a large mixing bowl, toss almonds in the egg white and vanilla extract until all are evenly coated. 3. In a separate bowl, combine brown sugar, cinnamon, and salt. 4. Add 2/3 of the cinnamon-sugar mixture to the almonds and toss until well coated. 5. Spread the coated almonds in a single layer on the paper-lined sheet pan and sprinkle the remaining cinnamon-sugar mixture over the top. 6. Bake for 1 hour, shaking the pan to stir halfway through. Let cool for 5 minutes before serving. Helpful Tip: Using raw or “natural” almonds in this recipe is an absolute must as pre-roasted almonds will over roast and get bitter upon baking. If you can’t find raw almonds in the baking aisle, check the end caps in the produce section, as they often have fresh seeds and nuts there as well. Mona Dolgov, thank you for your blog post.Really thank you! Awesome. How Well Do You Remember 80s Pop Culture?